spanish premiere of Descrittivi di stati d'animo di Didone (2004) for ensembe in Valencia , Palau de la Música de València performed by Grup Instrumental de Valènci, directed by Joan Cerveró. Klangforum Wien will give the english premiere of MANIA on November 20th conducted by Bas Wiegers at Huddersfield Contemporary Music Festival. 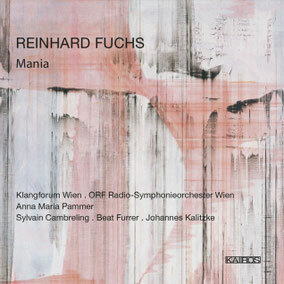 This records presents four major works by young austrian composer Reinhard Fuchs. Set in an aesthetic world influenced by Guiseppe Ungaretti, David Lynch and Jackson Pollock and by the structural idea of a palimpsest, each work has it's own character but is related to the other pieces on the record. Klangforum Wien's outstanding performance in the opener "Mania" (inspired by Lynch's Blue Velvet) gives that piece a hauting intensity. The new ring tone for WIEN MODERN is done! This concert will be broadcasted on Ö1-Radio on November 11th at 7:30 pm - listen to it at WEBRADIO Ö1. 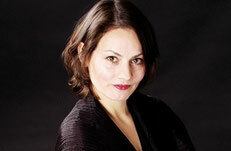 Listen to an example with Anna Maria Pammer (voice) in passionate action in Wo Angst auf Umhülle prallt for voice and orchestra.